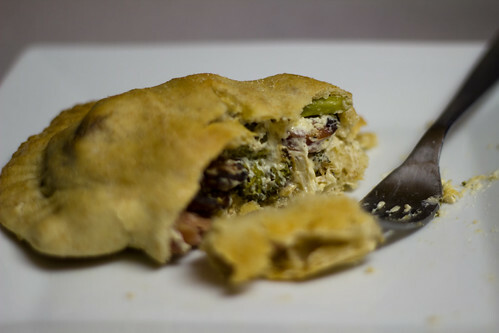 Calzones are so great for those times when you have a lot of random ingredients that you need to use up. For instance, we bought some chicken and apple sausages from Costco. I really liked them, but Nick didn’t care too much for them. When you buy something at Costco, you don’t just end up with one package. So, the other package of sausages have been sitting in our refrigerator long enough that I was worried we’d have to throw them away if I didn’t come up with something. Our broccoli was the same deal. We had a lot of it, and although we’d been slowly nibbling on it for awhile, (and adding it to a few dinners) I knew that if I didn’t use up a big portion of it, a big portion of it was going to go in the trash. And cheese! 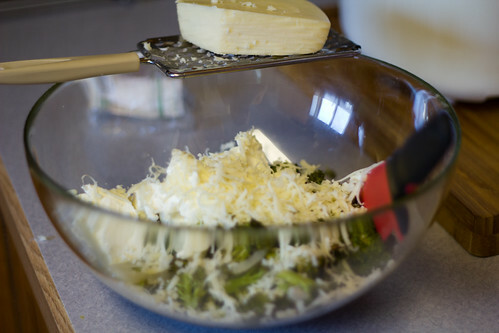 How did we end up with four different kinds of cheese? There’s no possible way we can eat that much cheese! Ok, so we totally can, but we needed to use it up faster than nibbling would allow. And voila! You’ve just used up a ton of ingredients and made something far fancier than pizza. And if you’re going to go, why not go all out and make a lot? You can freeze what you don’t need right away, thereby not wasting any food, and you have back up dinner or lunches when you’re pressed for time. 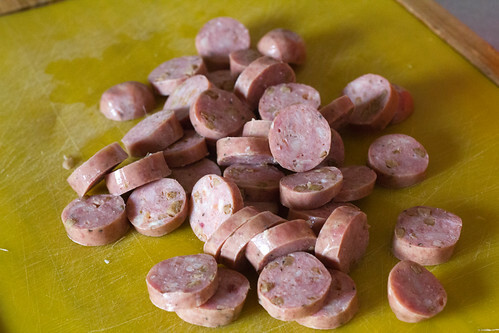 On a cookie sheet, spread the sausage out to create one layer. Roast on the bottom shelf of the oven for 30 minutes (or until done), making sure to move the sausage around on the pan several times to prevent burning. 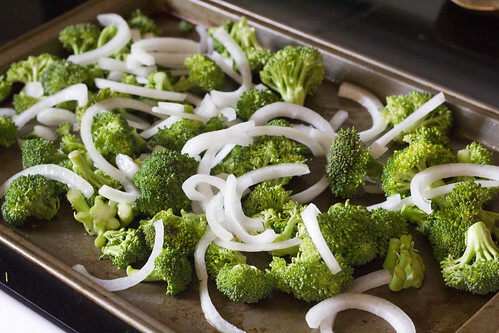 On a separate cookie sheet, spread the broccoli and the onion out to create one layer. Roast on the top shelf of the oven for about 15-20 minutes, moving everything around on the pan several times to prevent burning. 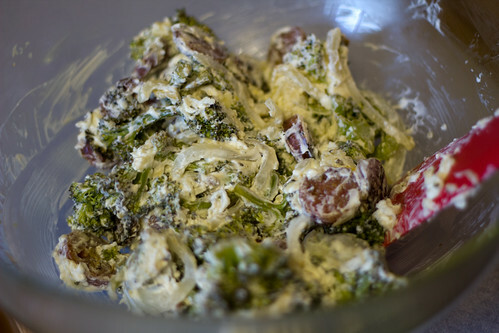 Set the vegetables and sausage aside to cool slightly before adding the cheeses, salt and pepper. Stir everything together until fully combined. Prepare a stone baking pan or cookie sheet by sprinkling cornmeal onto it. 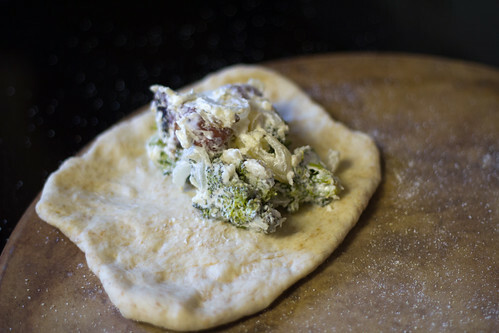 Divide the pizza dough into 8 equal portions, and roll or spread the dough to create little circles. 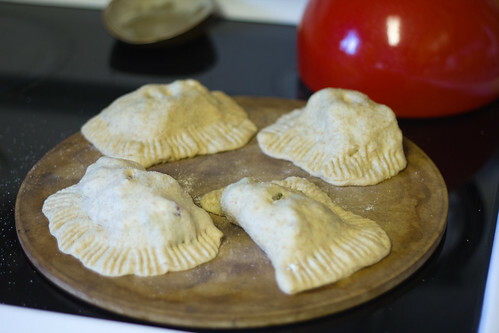 Add a few spoonfuls of the filling onto one side, leaving about 3/4 of an inch edge. 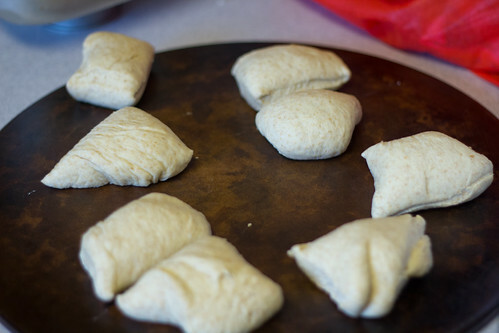 Fold the other side of the dough over to create a pocket, and use a fork to seal the edges. 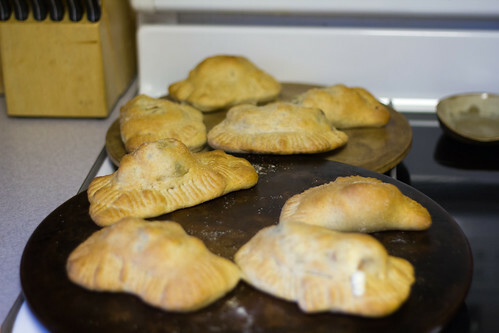 Cut a slit or two in the top, and bake for 20 minutes, or until crust is golden brown.